KAOHSIUNG, Taiwan:Taiwanese President Tsai Ing-wen vowed yesterday that the island would not concede one step in defending itself as she inaugurated two frigates bought from the United States aimed at boosting Taipeis naval capabilities against China. Rival China has upped military drills including a live fire exercise in the Taiwan Strait in April, declaring its willingness to confront the islands independence forces. China has also been incensed by recent warming ties between Washington and Taipei, including the US State Departments approval of a preliminary licence to sell submarine technology to the island. We want to send a clear and firm message from Taiwanese people to the international community that we will not concede one step in defending … Taiwan and protecting our free and democratic way of life, Tsai said after inspecting the ships. Chinas military actions in the region not only attempt to weaken Taiwans sovereignty but will also damage regional peace and stability, Tsai warned. She vowed to continue enhancing the navys capabilities as part of the militarys goal to maintain what it calls solid defence and multi-layered deterrence to guard the island. Navy chief of staff Vice Admiral Lee Chung-hsiao had said previously the warships anti-submarine capabilities are more advanced than the islands existing eight Cheng Kung-class frigates and could have deterrent effects against Chinas submarines. 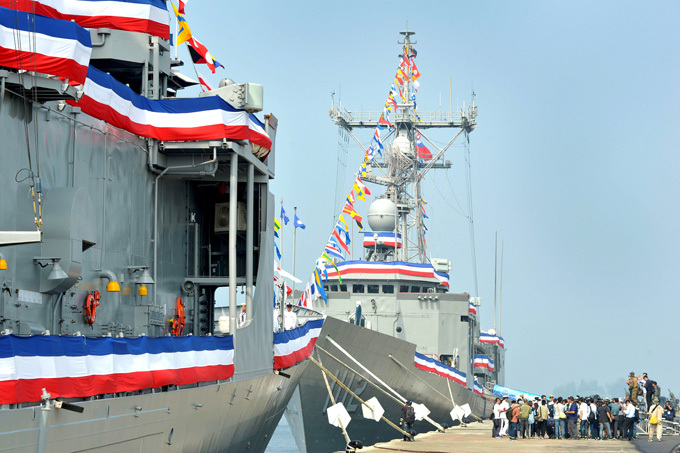 The US de facto embassy in Taipei, the American Institute in Taiwan (AIT), said the sale would improve Taiwans capability in current and future defensive efforts as well as stability in the region. The ships will be deployed to patrol the Taiwan Strait, the narrow waterway that separates the island and China, according to the navy. Beijing has stepped up diplomatic and military pressure on Taiwan since Tsai took office two years ago, as her government refuses to acknowledge that Taiwan is part of one China, unlike the government of her Beijing-friendly predecessor. In September, Washington irked Beijing when it announced plans to sell Taiwan US$330 million in spare parts for several aircraft. Washington remains Taipeis most powerful unofficial ally and its main arms supplier despite switching diplomatic recognition to Beijing in 1979.